Study Groups are central to the Wilmette Institute’s online courses, for they offer the opportunity to small groups of individuals to study together, enriching the learning experience and saving the members of the group some of the expense of the course. Here we provide you with basic policies and guidelines for establishing a study group and for understanding the purpose and functioning of such a group. If, after reading the guidelines, you have any additional questions, please contact the Wilmette Institute at learn@wilmetteinstitute.org or 877-WILMETTE (877-945-6388). Starting a Study Group. Any person or Bahá’í institution (such as a Spiritual Assembly) can initiate the formation of a Local Study Group. Begin by contacting potential members of the study group and asking them if they wish to participate. As soon as the group has two members (which is the point at which the group tuition begins to become cheaper than that paid by an individual), you can start the group registration process. If at all possible, register at least one month before the start of the course so that your group can receive an extra 10 percent early-registration discount. Watch the Study Group Essentials video. If you decide to form your own study group, see details below the video about how to register your group and organize group meetings. On the course registration page, click on the Register tab, and select the “group” rather than “individual” registration option. Complete all personal registration information. Check your inbox for your Registration Confirmation email. Consult with prospective group members on the payment options (see Study Alone or in a Group for details on payment options). NOTE: The Wilmette Institute’s registration software now allows us to change an individual registration to a group registration, but it does not allow us to merge separate individual registrations into the same group. Cost. The cost of creating the group and registering the first member is the same as an individual membership. Each additional member costs 60 percent as much as a regular individual membership. Thus two individuals in a two-person group average a 20 percent discount each; the larger the group, the larger the per-person discount. Our software is set to accept groups with as many as ten members. The fee must be paid by credit card (the registration website is secure). Payments by check are accepted, but you must contact the Institute to help you with the registration. See Paying Tuition by Check or Credit Card for the details. If a study group cannot afford the registration fees, it may ask its Spiritual Assembly for financial assistance. If that is unsuccessful or inadequate, the group can approach the Wilmette Institute for tuition support. Members. A registration requires, at minimum, the name, email address, and postal address of each group member. If you cannot figure out how to add new members, email us at learn@wilmetteinstitute.org and we can add them for you. The group’s confirmation number will open the registration system to add new group members, but it does not provide access to the course website. Each learner must receive his/her own username and password to access the course, including the online forums. Handling local arrangements for paying the registration fee to the Wilmette Institute. One option is for the Primary Registrant to register all of the study group members at one time and pay the entire fee by credit card. Another option is for the Spiritual Assembly to pay the entire fee or to reimburse the Primary Registrant after he or she has paid the fee. Yet another option is for the Primary Registrant to pay the entire fee, divide the total amount by the number of members of the study group and then collect a portion of the fee from each member of the group. Handling any local costs (such as photocopying, phone calls, refreshments) and passing them on to the members of the group or to the local institutional sponsor. Coordinating a consultation on group learning goals (such as joint projects, public discourse, or social action). When groups develop common goals, they will be more committed to completing the course. Planning a schedule of study group meetings. This should include the individual who will coordinate each meeting and whether any members will make presentations at them. The Wilmette Institute does not require learners to make a presentation, but it is a good way to learn. Contacting the study group’s mentor, and arranging a time the mentor can interact with the group (preferably, at least once a month). This is best done by speakerphone or cell phone or via a web-based audio or audio/video service. If the mentor is nearby, s/he may be able to meet the group in person. If the mentor’s schedule is incompatible with the group’s, the group can talk to the lead faculty member of the course or any other faculty member. Making sure the study group meets regularly (usually once per unit, typically six to eight times). Study units usually last one week. If a weekly meeting is impossible, the group could meet every other week. Wilmette Institute courses have a Grace Period of about four weeks after they officially end so that people can finish up their course work. 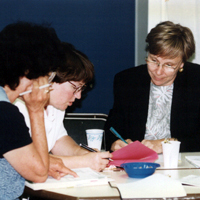 If necessary, a study group can schedule catch-up meetings during the Grace Period. Making a brief report (by email) to the mentor after each meeting. Every course has a forum where such reports can be posted. They could also be emailed to the mentor. Reviewing the unit’s discussion questions. Listening to brief presentations on the topic by one or more of the members of the study group. Discussing the unit with the mentor or other faculty member by telephone or other means, if the person is available. Activities designed to reinforce learning of the material covered in the unit (art work and small group discussion, for example). Planning outreach efforts. We encourage study groups to plan one or more presentations or service projects (at a Feast, a fireside, a deepening, a children’s class, a youth class, a study circle, a devotional, a public place, informal sharing, or in the community newsletter). All the materials prepared by the Wilmette Institute can be used unless they are specifically marked otherwise. This is an excellent way to reinforce ones learning. Planning the next meeting, including verification of the person who will coordinate and/or present and who will take notes. Attendance at Local Study Group Meetings. Members of the group should make a commitment to attend all meetings, barring unusual and unforeseen circumstances. Each group can set its own policy about whether it will allow or encourage visitors to attend occasionally. Interact with the entire study group by telephone or other means at a mutually convenient time, preferably at least once per month. Help answer questions about the topic of the meeting, pose questions for further consideration, and encourage activities of the group. Interact with individual members of the study group by email, read their projects, and read reports about their presentations. Receive reports from the group Correspondent about any meetings the mentor was unable to “attend” by phone or other means. Communicate with the Correspondent about strengthening the group, especially if the group is having problems (unable to meet, low levels of enthusiasm, etc.). Offer suggestions to the Wilmette Institute about improving study groups.